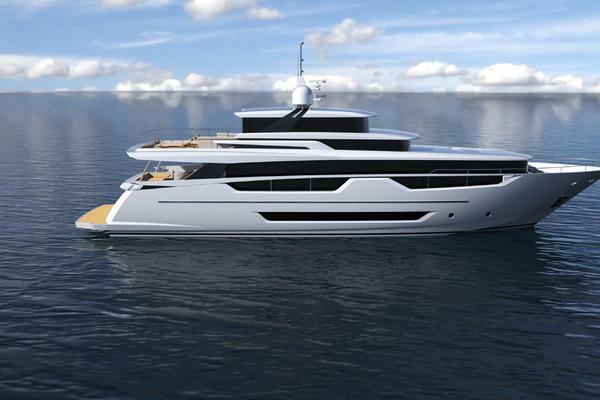 Available for Spring 2019 Delivery The all-new 85 Motor Yacht is a yacht with an imposing presence, her sleek profile reflects the latest thinking in Motor Yacht design whilst retaining the elegance of her smaller counterparts. This new model resets the benchmark for exterior Motor Yacht refinement, with luxurious finishes and materials used in abundance to elevate the motor yacht cruising experience. The flybridge is designed for entertaining al fresco with a large dining area opposite a well-equipped wet bar, further complimented by a large aft sunpad and forward facing seating areas either side of the helm position. Forward on the main deck is an impressive walkthrough seating area with additional sunpad. The sociable arrangement of the single-level main deck provides an expansive entertaining space with three separate seating areas including a large cockpit dining area, ample U-shaped seating area aft of the saloon and formal dining area adjacent to the well-equipped galley. The layout is designed to ensure the upmost privacy for guests with a separate wheelhouse and ability for the crew to move discreetly around the yacht, with the flexibility to open the galley to the aft saloon or separate it using an elegant electrically operated divider. Below deck guests are accommodated across four beautifully appointed ensuite cabins including a full beam master suite, two double cabins and one twin. Aft she features class leading crew quarters with two cabins and a spacious crew mess. United Yacht Sales New Jersey would love to guide you through a personal showing of this 85' Princess 85 Motor Yacht 2019. This yacht for sale is located in Unknown, Florida. For pricing details or a showing please contact us by filling out the form on this page and we will get back to you shortly!